Haha I’ve done alright, wouldn’t say I’m blasting it ha. 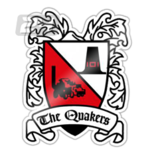 We had a great 3rd season dominating the league and winning everything, but the 1st 2 seasons I didn’t, with only 2 trophies combined in them seasons. Just got the team where I want it now so things seem to flow nicely and be going well, managed to get most of the players I wanted (bar one or 2) and got rid of all the players I wanted so makes it easier. In reality he's more of a DLP support as he runs from deep but DLP support to me dont get forward enough and barely dictate so as a playmaker he could do really well. I was going to ask whats the specific role you want, someone to build around or a playmaker to create alongside a great box to box to give a balanced attack/defence? I'd say his decision making is poor so be careful for players like him unless his stats have moved high up towards the 13+ mark. Go for it, yeah i'd really want him there cause he's a massive wonderkid most people go for simply cause he's cheaper and one of the greats of the future for sure. Tbh, in terms of a playmaker I'm not too sure atm it all depends on whether I lose Pogba. Pogba isn't the usual DLP I'd want in this system I'd probably prefer someone who doesn't wander as much as he does considering the box to box next to him is constantly roaming around but we're getting away with it cause he's so good. So maybe Tonali is the man I've been looking for. If I wasn't managing a top team I would tend to be a bit more cautious and perhaps play a DLP (D) instead of a DLP (S). 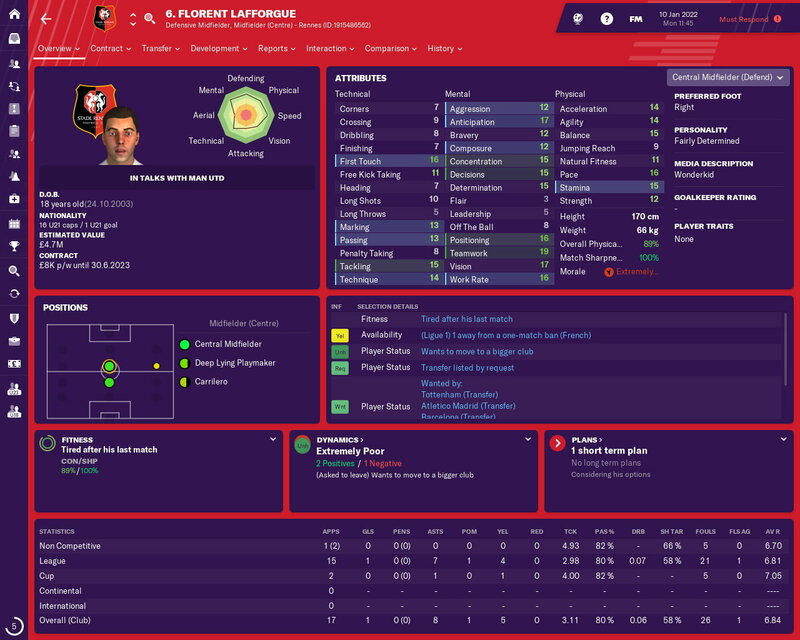 Also I got this guy in the youth intake in season 1, not sure what to do with him, seems quite poor in the air for a centre back. I've noticed that if they dont put bids in and lose interest you tend to keep them (obviously) but maybe but his transfer status value for around 150 mill just to unsettle the big bois after him and maybe it'd work to keep pogba. I'd say maybe he'd work there but if he's worked perfect as DM don't move him. Maybe try him pre-season or friendlies. As for your transfers, 6m is a steal for him, he's quite good. It seems you're like me in terms of CB preferences as I usually have decent headers, positioning and tackling with maybe some strength- like a bailly. Keep him and bring him through your ranks cause his value will rise and you'll make massive profit off it. That's what I tend to do. I've tried lindelof at CB and he does quite well but I worry about his aerial presence but seems to win most headers. Train his positioning as individual training and let him learn heading on his own (usually add a few training sessions based on jumping and heading/defending set pieces). With his potential so high i'd say when he's around 21-25 his heading will be about 13 and the rest will also increase by 2-4. If you push him well into the first team or u23's early/ loan to top clubs then it should work better imo. The only one I'd even consider selling is Mallo and getting in a better right back (I have the money for it). 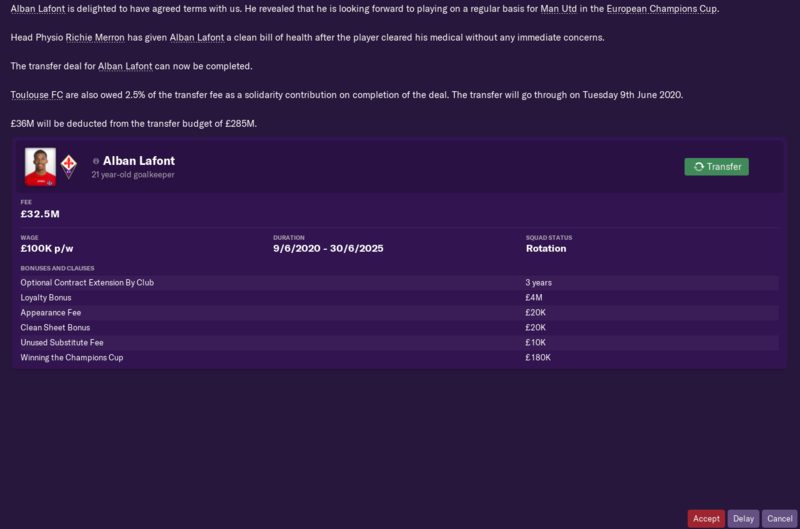 PSG came in at an initial £88 million for De Ligt, he made noise about wanting to move but I had a chat with him and reminded him that morale is high and he's playing in a brilliant squad, he agreed to stay. So that offer was rejected, and then PSG came back with a whopping £114 million bid! But like heck I was selling my best centre back so rejected that too. Haven't heard from them since. Another big should I moment? Your transfers activity in first season is like you playing fantasy football and you take a Wild Card. Why changing 20 players? Glad it is, usually works 99% of the time for me lol. IMO pereira is only looking good cause of the bugs helping him with long shots and those long passes he makes are one-offs. Mata is ageing so its best to get rid now than later. I'd say take him if you're getting rid of pogba or a role where asensio would take over cause having too many top end players/ creative can make it harder to control if things get out of hand. tbh I don't know why I changed 20 players in the 1st season, I think I was just stockpiling players. I haven't used half of the players I've signed but I sell them for profit at least. I just fancied a big clear out of the Man Utd deadwood I suppose. @BigV @zlatanera Thanks a bunch! A week ago I'd have paid £61m for Lafont. So any contract wisdom you can share? Would you bother asking Pogba to endorse the move? Board going for it as well! "remove and exclude from negotiation" both Yearly Wage Rise and Wage After Reaching Club League Games. Then lock Contract Length at 5 years, lock in Optional Extension By Club at 3 years, maybe put the Signing On Fee to £4m and Agent Fee to £3.3m, then up your initial wage offer to £110k. It'll save you in the long run. If they accept, go for it, if not, just try to keep things reasonable. Yeah same result I had as a pressing forward when I attempted it with him being in that role, maybe was a few of the roles around him too. I'd like to get the best from Pogba more so getting him to use his attacking talent to full use so may have to have a play around with his instructions maybe. Yeah what I was thinking but never know someone may get use of him from a winger if get him to not cross very often to waste opportunities. Nice one, glad we could help, i'd agree with @zlatanera in terms of getting rid of wage rise and reaching club reach games. Then i'd slightly increase appearance fee, clean sheet and possbily unused sub fee by a few thousand so its around 20-30k and unused sub to about 15-20k and double click the white padlocks till it goes yellow as you're putting your foot down into semi negotiating. If it was me i'd put the wage to about 90 and do the same with the lock but they'd probably ask for more as your getting rid of future wages so if they offer you another wage (left side) then slightly lower it by 7 or 5k and it should work if you semi negotiate. They may even allow it lower as you're giving them more money to appear/unappear in games to a total of around 15 mill on top of that 81 so it's like 96k. It's a possibility but chances are it's low as you're getting rid of yearly wage rise. In my teenage years I often did big turnovers, but certainly not as massive as his! To be fair, I only used 5 of those 1st season signings the rest were loaned out. It's my biggest regret that I've not given the existing youth at Man Utd a chance. Pogba is being a pain in my game. Barca made a bid for him, I basically told them I want 80m upfront and then another 50 across 3 years with some high games clauses in there etc. Came out to around 150 mil, which given he was the players player of the year in the prem and a champions league finalist isn't too shabby. They pulled out, which is fine. He then had an almighty fit about not getting to go, and it got worse when I told him I wanted 150m. He said something like 87 was more likely, and I told him to rod off as he doesn't call the shots. 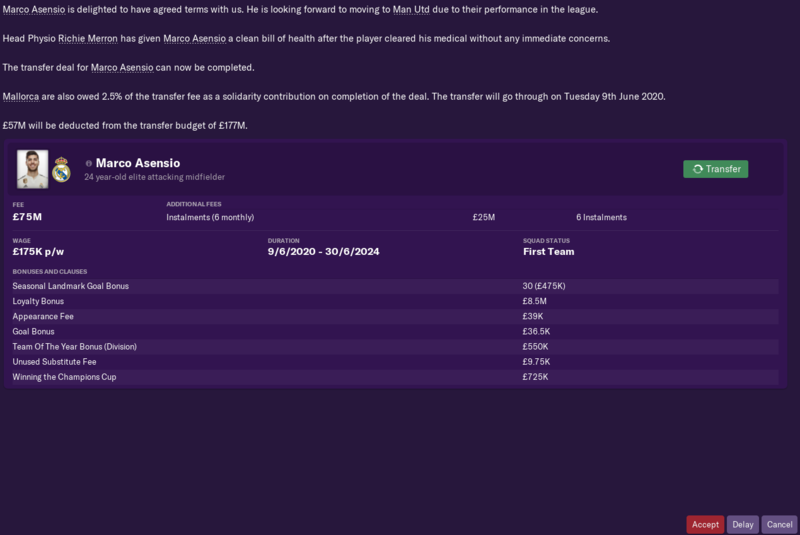 I am happy to let him rot, as I can sign Gedson Fernandes and I managed to get Savic (For 90m in total, City were sniffing around so I had to fight them off). Wow thats pretty drastic lol. If you push him back into the side he'll drop the issue. They do it so often and has happened in so many FM's that it's practically game time issue and having "fake faith" will make him go back to normal. Remember that words "buy when you are storng" from Alan Hansen who also said that "you can't win anything with kids" and that was in 1995. We all know what happen in next 20 years at Man UTD. We just need to find some reasonable number of world class player to buy every year (just one or two). And this is something that was very important to Glazers family when they give me contract extension because I fail to win PL in season 3. I'm always minded towards doing two saves with United - one where I just buy the best players I can find, and one where I focus a lot more on the youth and buying British. 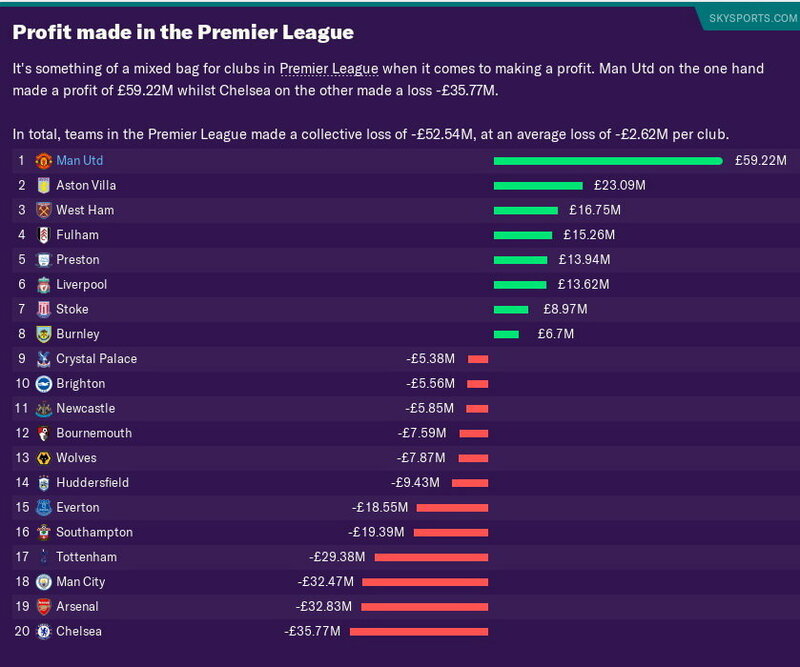 Tends to be I just do a mix that leaves me unsatisfied around 2.5 seasons in and I quit (like my FM19 United save). First leg of Champions League Semi-final. 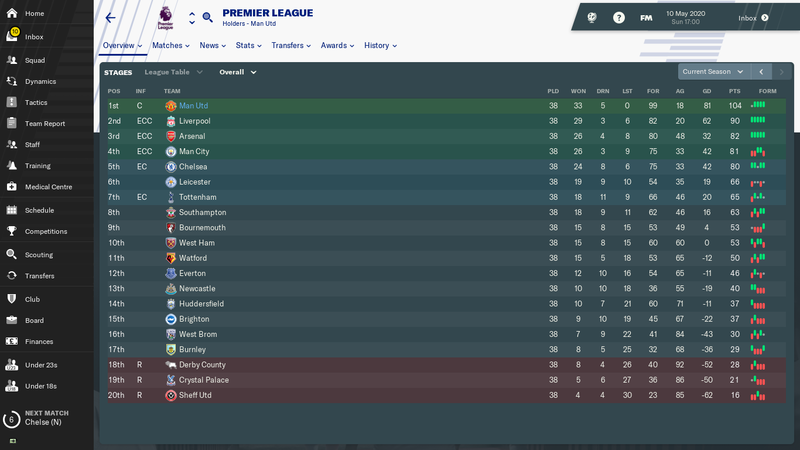 Finally done an unbeaten season in my third season. Scored 107 goals and kept 27 clean sheets. Pogba has cleaned up on pretty much every award possible aswell as scoring 30 goals as a mezzala. 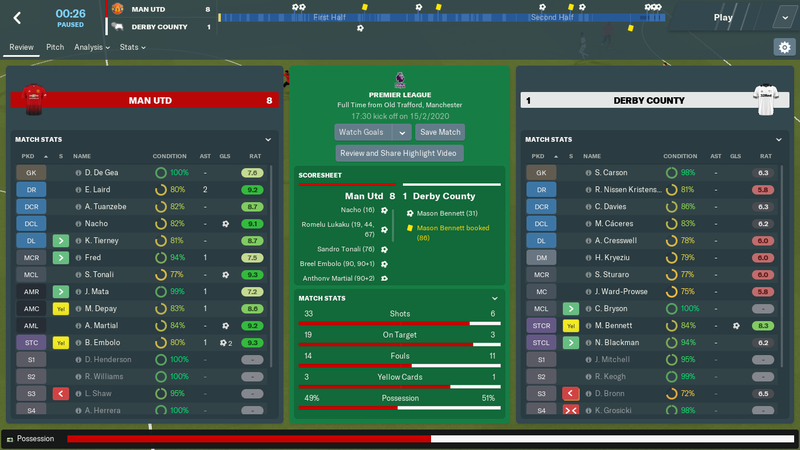 The only game I lost was in the third round of the fa cup away to Cardiff. Is this the thread where we post suggestions for stat changes for the next update? 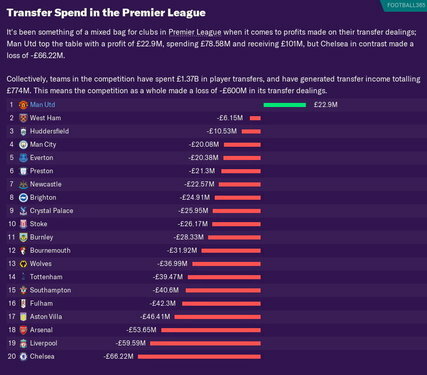 When doing big transfers I do save the game and have a couple of attempts to gauge what the players are after wage wise, signing fees and bonuses wanted etc. I tend to lock out bonuses for appearances clean sheets goals and remove wage rise clause. Also where agents are greedy you can remove the signing on fee to player and add less to agents fee for same deal. Real Madrid made an offer of £66.5m up-front with another £27.5 in 6 instalments to make a total of £94m for Lukaku. I rejected it even though Lukak said he wanted to go. I refused the offer. That set off a squad mutiny as they all feel I should let him go. They have now made another offer of £73m up-front with £30.5m in 6 instalments to total £103m. I don't think I'll be able to reject the offer, keep Lukaku and the rest of the squad happy. Lukaku is worth £55m and is on £180k a week. I have Rashford, Martial and Fiete Arp as my other strikers. Sanchez is out for 3 months with a torn calf muscle and is nearly 31 so I can't depend on him to be my long term striker. Should I sell Lukaku? I am about to start the 2019/2020 season. I have £85m of my transfer budget left, having spent £54m on Sergej Milinkovic-Savic and £53m on Daniele Rugani. Add on the £73m gives me at least £158m to spend. I'm trying to clear out Matic and Rojo which could add another £30m or so to the kitty. If I do sell Lukaku, who should I sign to replace him? @Marc Lister what's your tactic? Like what roles are you normally using Lukaku, Rashford, Martial and Arp in? Also how's Mason Greenwood doing for you? After all that effort to get Lafont I don't know whether I'll ever use him. As I'm undecided as to what the point of continuing would be now I've won the Champions League. Season 2 complete. 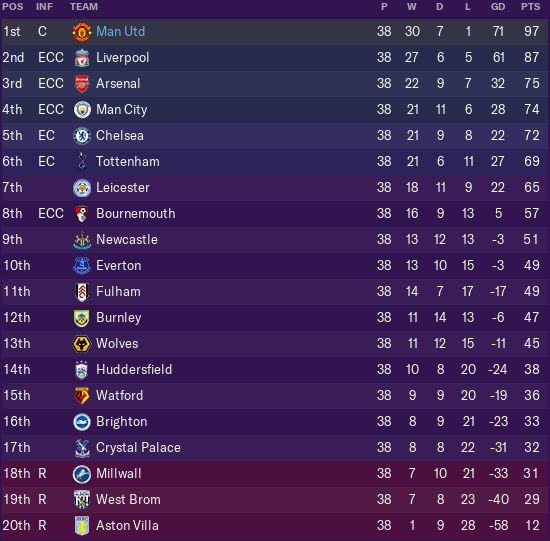 Finished unbeaten in the PL, smashing all sorts of records and also had one of the biggest wins I've ever had on FM in a league fixture. Oddly enough I saw Porto and PSV also had invincible seasons in their respective leagues. 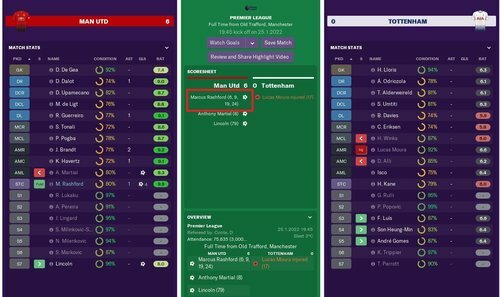 We managed to win all the minor trophies & retain our FA Cup with a 2-0 (AET) win over Chelsea, but we exited the League Cup and Champions League in the semifinals of each competition to Spurs (2-0 agg) & Bayern (3-0 agg) respectively. I was very frustrated because not only did we have Lloris & Neuer putting in world class performances, but we were also missing sitters & smashing the woodwork several times in all four legs. 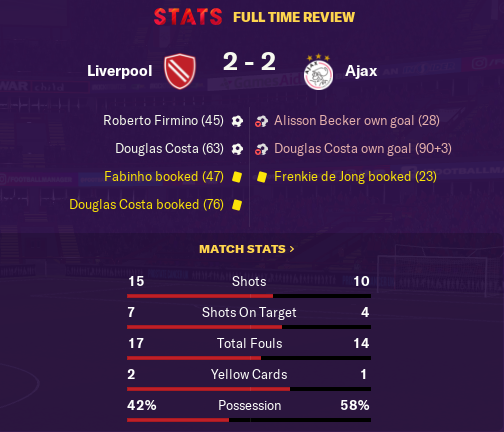 Wouldn't mind if we'd been dominated but this was just typical FM nonsense tbh. In the summer Bailly requested to leave because his contract only had a year left & he wouldn't have been granted another work permit. 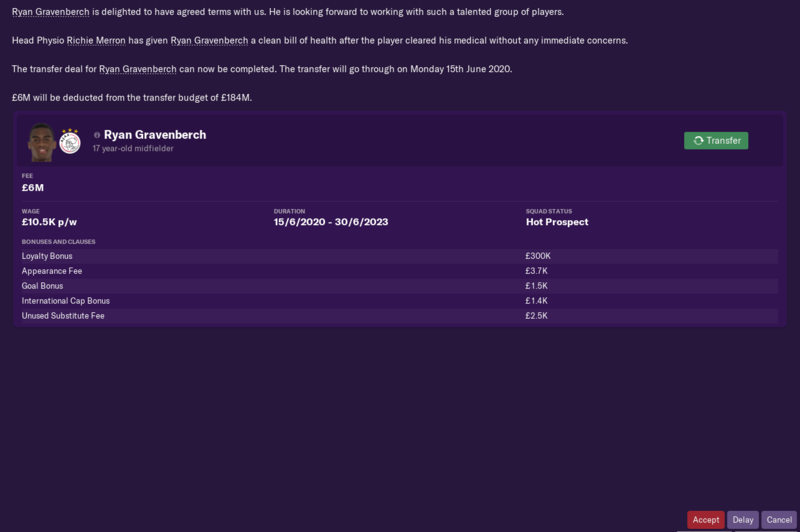 So instead of letting me know this in June or even July, he waits until there was only a couple of days left in the window to inform me of his situation and unfortunately when I offered him out he didn't attract any good enough offers. In the end I just decided to bid for an unhappy Fekir & I threw Bailly into the deal, which worked out well for him because Lyon won Ligue 1. Fekir for me though was pretty average in every competition bar the Champions League, only scored 9 goals too so it's not looking like my best business so far. Sanchez decided he wanted to leave in January because he wasn't starting enough games, so I was happy to let him go, shame we'll be paying him £150k a week still for another 3 years. Embolo was a bargain replacement scoring 8 goals in 16 games, covering well for Suso, who was excellent in the first half of the season but dipped dramatically in the second half. Breel has sided with Martial in a contract dispute though, and he "doesn't appreciate my position as manager'' so the ungrateful swine might not survive the summer. 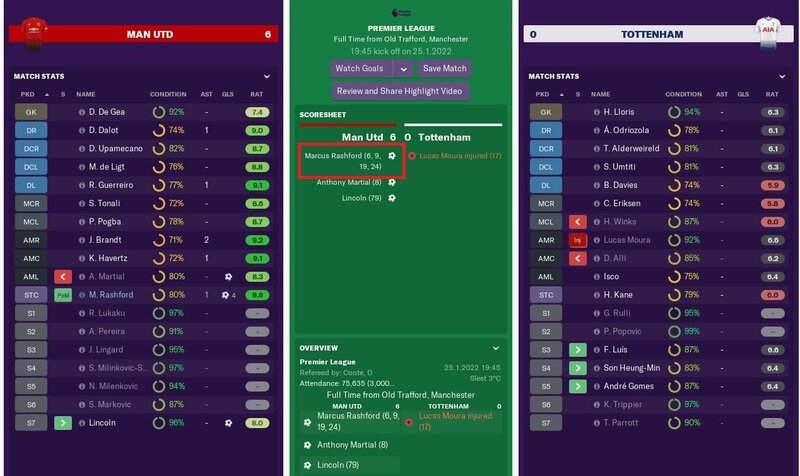 Rashford was also on fire in the first half of the campaign but dipped in the second, so he finished on 20 goals when at one point it looked like he'd get well over 30. Pretty disappointing that. Fortunately Lukaku stepped up and padded out his goal stats from Winter onwards, still a frustrating inconsistent lump mind. 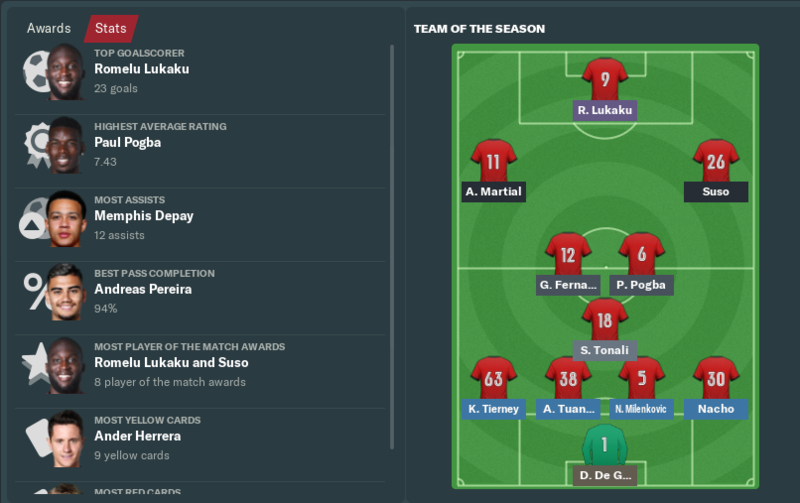 Suso and Pogba had 15 goals each (in all comps) so they were my next top scorers, which just goes to show how poor a campaign Martial (top scorer in season 1) had. He finished with 9 goals but 4 of them came in the last two fixtures (1 in the FA Cup final, and 3 in a 5-1 thrashing of Sheffield United) and I don't think he'd scored a single goal until late December. So often he's averaged 6.4 in games, completing less than 10 passes, missing sitters, yet he thinks he should be on higher wages, laughable. 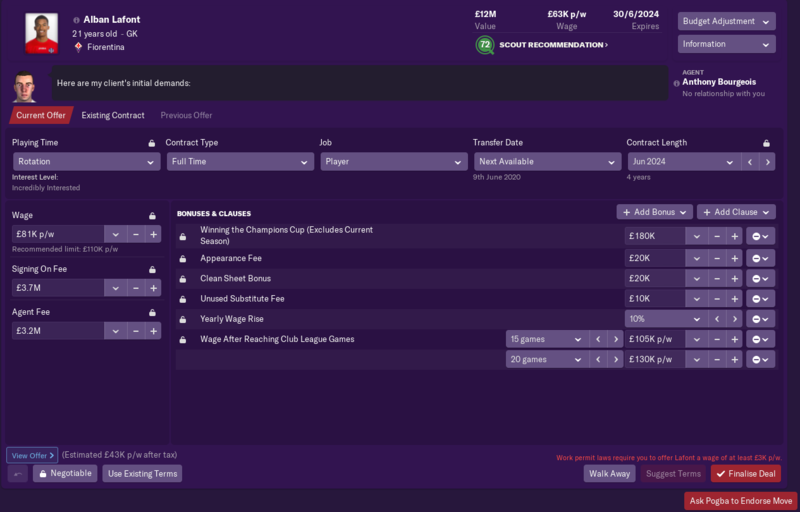 He's refusing to discuss his contract at the moment because of the European Championships but once he gets back from there I'll sell him if he doesn't drop the ridiculous demands. Memphis actually scored less than Martial but he at least made up for it with the assists & his effort on the pitch, surprisingly he replace Alexis as a team leader too. Highly recommend Tonali & Gedson Fernandes, both of whom will probably be regularly starting alongside Pogba if Casemiro & Herrera keep putting in average performances. Even though he's my fourth choice CB Tuanzebe was very impressive all season, his attitude to training is poor but he certainly makes up for it on the pitch. Ethan Laird is another who has stepped up really well when I've needed to rest Nacho & Dalot. Lukaku is decent on fm but personally I would sell him, that's a great price. I sold him after the 2nd season to Madrid for 70mil so a deal worth 103mil is a great deal. Replacement wise, Rashford has been amazing for me and if you can get him performing, he can be incredible. Otherwise if you want someone world class there's always someone like Icardi. Well could try defend and retain the champs league, try and beat and get past Liverpool's 5 trophies. Try develop some of the youngsters and win it with them. Trying to beat Liverpool's 5 trophies, should be more than enough motivation haha. No doubt Salah will score 5 away goals in the 2nd leg and dump us out, but I don't think I've ever been happier after a game in which my team hasn't scored before! Last season I used a 4-1-2-3 formation. Used Lukaku on Attacking Forward or Poacher. Rashford was used as a Poacher mainly. Martial I have barely used as a striker, almost exclusively as an AML. Arp I've barely used since I bought him so can't comment. Greenwood looks OK, will give him a few games next season to see how he progresses. Been on another forum I frequent and been suggested Belotti of Torino. £90m foreign club release fee so think I'll get him as the Lukaku money pretty much pays for Belotti's transfer fee. Trying to get Rashford to perform is a task! You know the Season Stats on a player's page? Any idea how to get the last season stats to show up? Want to better examine how Rashford did last season. I can tell you that he made 24 league appearances and scored 5 goals with an average rating of 6.78. I'm clearly not getting the right instructions/roles to get Rashford performing as I know he can. So I'm in my second season and dominating all comps. I've got Chong & Gomes out on loans but when they come back I want them to start. So I figure Chong on the right as an IF is ideal, but what about Gomes? I play a 4-3-3 with Ndombele, Pogba & Milinkovic-Savic as my midfield and Gomes doesn't have the physical presence that I look for in midfield. I feel like his best position is as an AP in the no. 10 position but I will not change my winning formula just to shoe-in a 2.5 star 19 year old. On half way season four and just can't forgive myself for not selling Lingard or A.Pereira. They were one season miracle, for me. Should I go with 29mil£ for this regen? Been on another forum I frequent and been suggested Belotti of Torino. What other forum if you don't mind me asking? Been on another forum I frequent and been suggested Belotti of Torino. £90m foreign club release fee so think I'll get him as the Lukaku money pretty much pays for Belotti's transfer fee. I have signed Belotti he is pretty good, you will get him for a lot less than 90mil though so don't just bid his release clause, I signed him for 45mil. 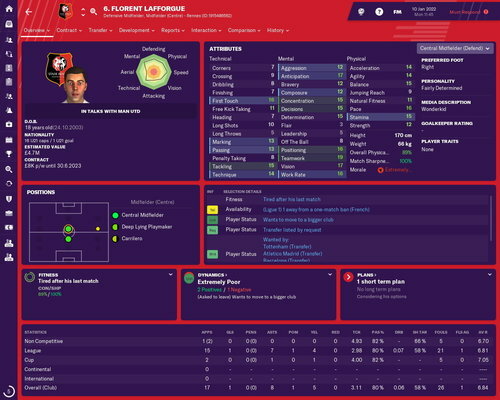 He had a good 1st season with him, but has struggled a touch in his 2nd season with me. Any idea how to get the last season stats to show up? Go to the history on the players profile and that brings up all the previous seasons. Gomes can play on the left hand side as an inside forward, I have played him there a few times. His best position is the no10 role but is equally as good on the left. I bid about £73m and after a bit of thinking they accepted it. The history page only shows the league info doesn't it? Doesn't show all games such as cup and European? Problem is now that Barca and Real Madrid have come in for Bailly and he wants to leave. Both clubs initial offers are lower than his actual value. His contract runs until end of season so might have to sell him. PSG came in for De Gea but I asked him to stay. Luckily his contract runs until 2023. I`ve started my new save with United on the day Mourinho was fired (December 18th, with a custom db). Here are my results so far. And this game, biggest score against a Top 6 PL team.